for the sunspot data, the cycles beginning with Zurich numbering -3, starting Apr. 1712, up to and including cycle 22 (Usoskin e.a. ) ending in 1996. We use the min-min length given in this reference. 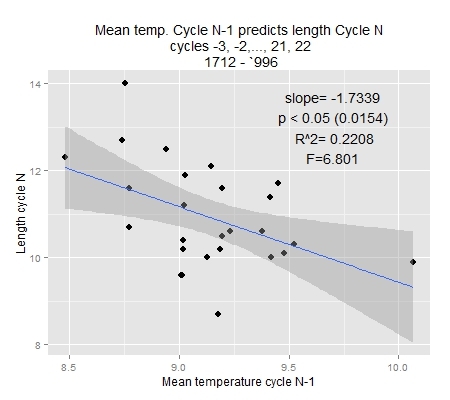 Using standard regression we compared the cycle length in years (y-axis) with the average temperature of the previous cycle. We found a significant reversed association (p = 0.0154, F=6.801) of -1.7339 year of cycle length per degree Celsius. 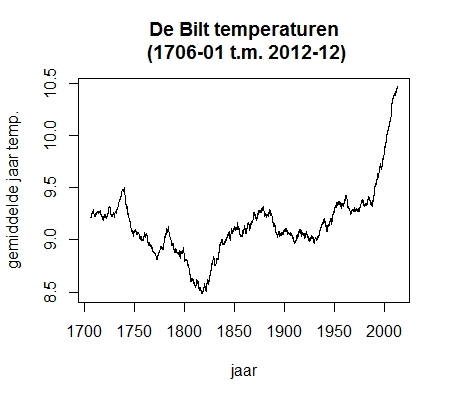 This is a reconstructed continuous monthly time series, with records going back to 1706. Although it says “year average”, that is not completely true. For every month the seasonal variation has been subtracted or added. That makes the graph a bit more wobbly than the usual moving averages but also a bit more accurate. Of course this is only from one (small) country, but after seeing this it is hard to believe that the world temperature stays the same. Sunspots appear and disappear in a regular fashion. If we plot this in a diagram that shows the travel of the sunspots over the surface of the sun, we get the famous butterfly diagrams with a period of about 11 years between 2 cycles. In a sense, the cycle length is a man made artifact, because new cycles start before the oldest disappears. The convention is that the time when the number of sunspots is at its lowests signals the start of a new cycle. 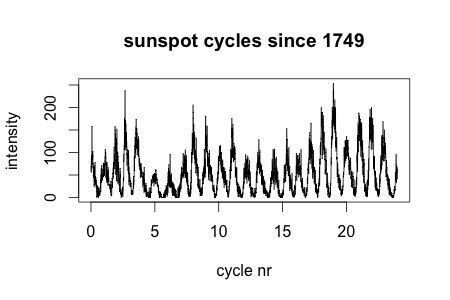 All sunspot data series contain reconstructed data with a higher uncertainty than recent data. Heldere analyse, Jan, ik ben overtuigd…. Mijn complimenten voor je ijzersterke en bijzondere heldere reacties in die Sargasso-discussie! En, niet te vergeten, voor je uithoudingsvermogen! Dank je Hans, mijn eerste poging bevatte een foutje, en daardoor vond ik deze “betere” onmogelijkheid die echt “staat als een huis”! Waarom ‘t werkt weet ik zelf niet precies. Zou je me een mailtje willen sturen? Goff zei O.k. Let it be.